The title Honeyfish comes from a transliteration of the Greek word, Μελανούρι (melanouri), which is a kind of fish (saddled bream to be precise). However, the poem and the book are really more about figuring out what kind of being one is, what one can become, what names one can claim or is claimed by, and how one translates oneself across the various contexts one encounters. Honeyfish posits that when you bring your body to a space, it is both an act of agency and of faith. Through the lens a Black immigrant woman—the poems’ lyric “I” and eye— this collection contemplates the shifting ground of legal, cultural, sociopolitical, historical and personal landscapes in search of a place to stand. The poems wander and witness, wonder and grieve; they hold experience up to the light. This book asks: What does it mean to belong to a place? How does one make, find, leave and rediscover home? These poems love. Prophesize. Return us to our beginnings. To days that we want to remember. Or forget. But don’t. Thus in our sister’s memory, we survive in the luxury of dying. The courage of loving. The re-imagining of our souls for another generation. Thank you, my dear sister for your words saluting our living, our lives. After Trayvon Martin, after Tamir Rice, after Sandra Bland, after Charlottesville and Charleston, after, after: Lauren K. Alleyne’s poems answer the alarm. 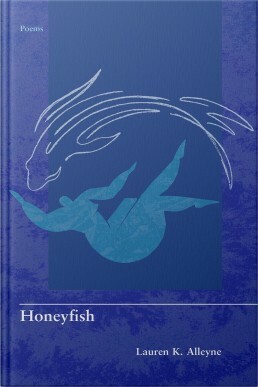 In Honeyfish, there is no end to elegy: the poet “can’t stop counting/the bodies,” nor tallying “our numbered days.” Moving between the United States and Greece, yanked between agony and anodyne, Alleyne gathers the evidence, then offers us the proof of herself and the graceful testimony of her poems." In poems spun from seemingly effortless language, Lauren K. Alleyne’s piercing voice emerges. Honeyfish sounds a litany of grief for home, country, and lives in danger of being erased from personal and collective memory. Naming the victims of racism and police brutality—Trayvon Martin, Tamir Rice, Sandra Bland…—Alleyne places their stories alongside her own, as a black woman and immigrant to the US. The task of remembering the poet shoulders is replete in the forms the poems often take: the elegy and ars poetica. Alleyne bears witness to the ‘world ruthless with beauty,’ and her poems are a singular act of resistance and power. “Who will sing you?” the poet asks, at one point—which is another way to ask, who will see and honour those who are gone? The answer is found in these compassionate, impassioned, and clear-eyed poems: This poet. This book.